Gyoza are one of my favourite ways to start a Chinese or Asian meal. These lovely little dumplings are always packed with flavour and never feel too naughty. Having regularly craved them at home, this week I decided to give them a whirl myself. 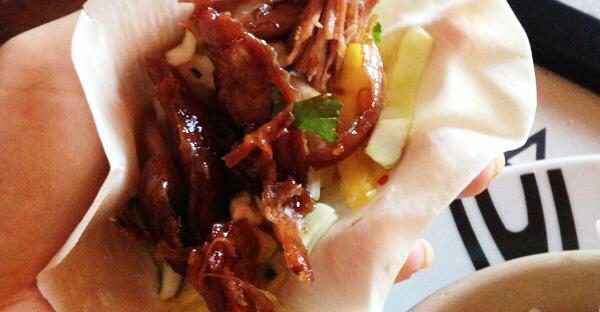 I’ve had these lovely Chinese steamed buns so many times when I’ve eaten out and I’ve often wondered if I could make them Weight Watchers friendly. After craving them again this week I decided to give it a go and the result was a great success. My recipe below makes 12 buns which are 5sp each so you could either have 2 or 3 as a meal or serve as a starter and have 1 or 2 per person. I’ve had a hand held spiralizer in my kitchen drawer for a while now and it hasn’t come in too handy, mostly because the noodles it produces are rather thin and flimsy! After having a whirl on an amazing table top Hemsley and Hemsley Spiralizer at a recent Weight Watchers photoshoot I knew I had to have one (albeit mine looks the same but was £12 from The Range). My other half loves chicken satay from the Chinese takeaway, but knowing how naughty it is, it’s not something we have very often. I’ve therefore wanted to make my own healthy version of satay chicken for a while now and this week I decided it was time to give it a go. 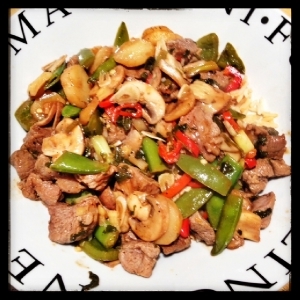 Sizzling Beef with Spring Onions & Black Bean Sauce – Only 12sp! This was a recipe made for me by my lovely best mate’s OH and it was so nice I bought the recipe book to make myself a smart point friendly version. It’s from Jaime’s Ministry of Food (original recipe here) and comes in at a very reasonable 12sp each. It’s a nice change to have a different stir fry sauce like black bean and the addition of rice instead of noodles makes another welcome change! I’m a huge fan of Chinese duck pancakes but often find the standard shop bought hoisin a bit plain and dull. This recipe (an adaptation from a good food recipe) spices things up a bit and takes hoisin to a whole new level, The mango slaw adds a whole new element to the mix and really was a revelation, such a low point accompaniment and so fresh and delicious, it will become a regular in our house with many dishes from now on. I served this dish with 2 Chinese pancakes per person (you can buy these in Waitrose, 10 for £1.19, 1sp each) but as my OH likes his carbs I also bulked the meal out with a little rice.